The inhabitants of the British place Glastonbury, will tell you that Avalon is there. Glastonbury is located in the district of Somerset, in the southwest of England, not far from the city of Bristol and some of the most well known stone circles Stonehenge and Avebury. The well known mystic Dion Fortune, who lived in Glastonbury in the beginning of the 20th century, called Glastonbury: ‘Avalon of the heart’. For her and also for me, the two places are connected: Glastonbury is the physical place, which you can see with your eyes, and Avalon is the spiritual place, which you can see with your inner eye. 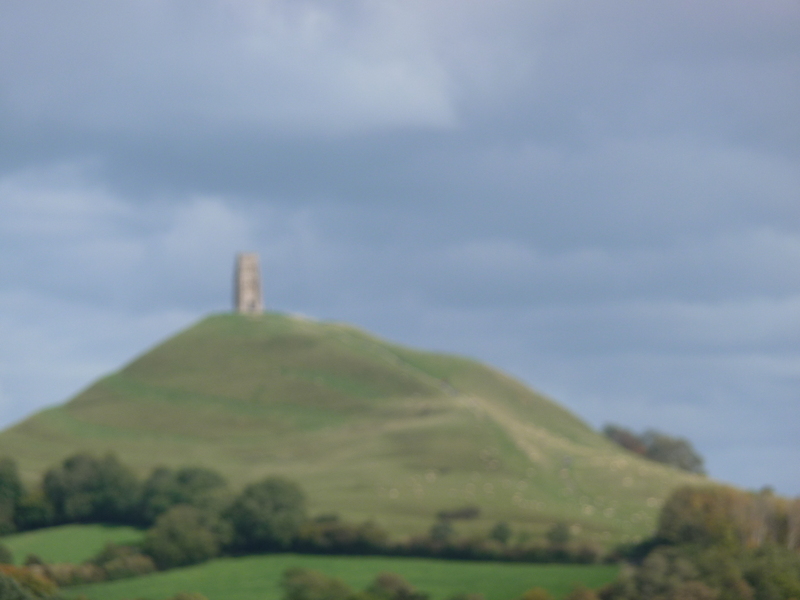 Many myths and legends also indicate that Avalon is in Glastonbury. In this book I also go with that assumption. Glastonbury is also called the Isle of Avalon and this indicates that Glastonbury used to be an island, like Avalon. However the two names have different meanings; Glastonbury is derived from the Celtic name ‘Ynisvitrin’, which means the isle of glass. This name was given by the Celts who founded two villages on the edge of a big lake around 300 years B.C. : Glastonbury and Meare. According to stories which were later proven by excavations, the dead were buried on the foot of the Tor. The name Ynisvitrin indicated the Tor, which was then surrounded by water. The fact that the Tor is still known for holding the underworld, the world of the dead, may very well have to do with these old stories. This can be a first connection to Avalon, which is also known as the other world, or maybe even the second connection. The first being that both places were surrounded by water, the second that both places are known for being places of the dead. 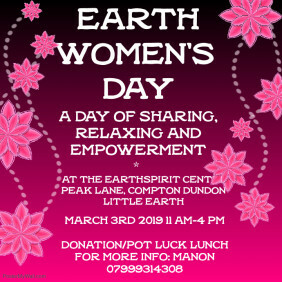 A third connection is that according to a well known legend, Avalon was in direct contact with the glass castle of the fairies, ‘Caer Sidi’,; a spiral castle where the natural energies of the earth came together with the supernatural powers of the underworld. Caer Sidi was also the place where the sorceress Cerridwen guarded the cauldron of wisdom. The same cauldron that is known to be under the Tor. 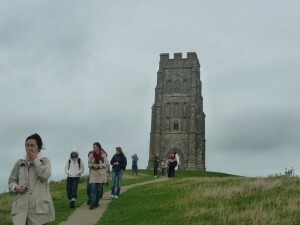 Other legends, known from as early as the 6th and 7th century A.C., give indications that The Tor, Glastonbury and Avalon were connected. Through the centuries the water surrounding Glastonbury disappeared and the land is now completely dry, although signs of it having been a swamp area are still visible. In the land you can also sense a feeling of magic, which is especially to be felt in certain specific mystical places in and around Glastonbury. In earlier times Glastonbury was an island, surrounded by water and marshland. The only thing connecting it to the mainland was a small strip of land to the east. There was a strange hill in the middle of the island that could be seen from far away but more often than not was covered in mist. At the bottom of this hill were two springs: one containing red minerals and the other one white. Before the arrival of Christianity, the island was already cherished and probably inhabited by long lost cultures. It was more than likely a Neolithic culture that created the labyrinth’s terraces on the hill. The island is roughly circular in shape and has four important hills: the Tor, Chalice Hill, St. Edmund’s Hill and Wearyall Hill. If you were to look down from above you could make out a woman’s figure from the outline of the hills, whereby the Tor is her left breast, Chalice Hill her hip and Wearyall Hill her raised knee. The Tor has a very special energy that everyone can feel, even the most unaware tourists who have just included this location in their travel schedule and for the rest don’t think too much about it. There also appear to be two important ley lines crossing underneath the Tor: the Michael ley line and the Maria ley line. These ley lines connect important places from all over the world to each other; places that have powerful energy. The make up of the Tor is somewhat strange in comparison to the surrounding landscape, which in contrast is flat and not at all hilly. The Tor can be seen from far away and sticks out like a big bump on smooth skin. 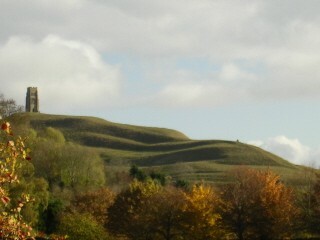 Researchers assume that it is a natural hill but can offer no explanation as to why it is there or how long it has been there. It has been in existence for a very long time and was surrounded by water and marshland in earlier times. The Tor is mentioned in many mythological stories and people suspect that it was once used as a holy place for druids and priestesses to carry out their rituals. There is an old church tower on it now: St. Michael’s. This tower is a typical example of how the church wanted to control the Tor, which was a symbol of the old religion. However, this male phallus symbol is definitely not out of place among the hill’s female shapes. In an older time, before Christ, there was probably a stone circle on the top of the hill. This was removed when the old religion had to make way for the new one. The stones were later used to build the Abbey and other buildings. A chapel was built on the Tor for St. Michael during the time of the Normans. It was destroyed during an earthquake in 1275. Approximately fifty years later the chapel was rebuilt and a tower was added in the fifteenth century, the one that still stands there now. The rest of the church was destroyed during the reign of Henry VIII. Gwynn Ap Nudd is the King of the Fairies, at any rate from the Welsh branch: the Tylwyth Teg. Gwynn is the leader of the wild hunt and the Lord of Annwn (the lower world). Nudd (pronounced as neeth) means black or night. In his role as leader of the wild hunt Gwynn is connected to Herne, the knight on the black horse, and to the horned God Cernunnos. In the northern part of Britain, Gwynn rode together with King Arthur in the wild hunt but in Scotland Gwynn is King Arthur. King Arthur’s hunt was the great boar hunt but another reason for the hunt was to find the souls of the dying and to carry them across to the other world. This other world lies underneath the Tor, which is why the Tor is seen as the gateway between two worlds. The Egg Stone is a stone that can be found on the side of the Tor – according to legends you can find the entrance to this other world, the realm of the fairies, behind this stone. I have been to the Egg Stone a few times since but each time the fairies play with my sense of direction and I come out in the wrong place and then I either have to climb up or down to get to it. The Tor is the gateway to the other world, the world of the fairies, souls, nature beings and much more. Is this why we get this homecoming feeling when we see the Tor? Is this the world we know from before our time here on earth? Is this the world we return to after our death? That feeling of homecoming must come from somewhere, from some experience – the experience that you recognise when you feel its energy. There is no way you can know that or feel that if you have never been there before. There are more of these types of gateways in the world, which have the same type of energy and can awaken the same sort of homecoming feelings. For example, you can find them in Peru at the famous Inca Temple of Machu Picchu or at the Pyramids in Egypt. The experiences that I have been able to share to date with others, who have also been there, are recognisable and correspond in many ways. There is also a theory these days that these gateways are all linked to each other. In any case, it gives you plenty to think about and we are getting closer to discovering an explanation for this mystery. For me personally it explains a lot and now I can understand a lot better why I am so busy with my search here on Earth: I am just trying to get home! However, getting home is not only about finding your way back to the other world but also about the feeling that you can evoke within yourself. It is in your core, in your soul and not outside of you.